These easy, creamy dessert bars are made with less sugar and more lemon flavor. Delicious with either regular lemons or Meyer lemons! Rather than calling for several cups of sugar, the lemon filling is made with a can of sweetened condensed milk, which adds creaminess and sweetness while allowing the lemon flavor to really shine through. I added a generous helping of finely chopped lemon zest to bump up the lemon factor even more. When I brought a batch of these bars to a big Thanksgiving potluck at a hunting cabin in the woods last fall, I told everyone they were called Pucker Up Lemon Bars and were for serious lemon lovers only. If you're a lemon fan, these just might be the lemon bars of your dreams. They're definitely mine. And my lemon loving hunky farmguy is crazy about them too. Note: After cooling completely, the pan of bars needs to chill in the refrigerator for at least 2 hours before cutting and serving. Because these lemon bars taste rich and pack such a lemony punch, sometimes I cut them fairly small, which makes them perfect for when you just want a little something bright and sweet. I'm thinking about making them with Meyer lemons next time. Update: These are wonderful made with Meyer lemons! Less puckery, just smooth and lemony. Joe and I are both thinking we might actually like the Meyer lemon version even better. Don't dust the bars with powdered sugar until just before serving because it quickly melts into the filling. And if you're going to transport them, I would leave them in the pan and wait to cut them up until you get there. As always, I urge you to seek out local and organic ingredients; they're better in so many ways. Organic butter, flour, and powdered sugar are easy to find these days, and you can even buy organic sweetened condensed milk for not much more than the regular stuff. The bright yellow color of these bars comes from egg yolks laid by our flock of happy, free-ranging hens. Look for real farm eggs at farmers' markets or search for a farmer near you on Local Harvest. Heavy duty baking pans make all the difference and will last for years. I really like the commercial bakeware from Chicago Metallic and USA Pans. 1. Heat the oven to 350 degrees. Grease a 9-inch square baking pan. Line the bottom of the pan with unbleached parchment paper (I love this stuff), leaving an overhang on two sides. 2. Make the crust: Using an electric hand mixer, beat the butter, powdered sugar, and salt until light and fluffy. Add the flour and mix on low speed just until combined. Press the dough into the bottom of the prepared pan, then prick all over with a fork. Bake until lightly golden and the edges are just starting to brown, about 18 to 20 minutes. 3. Make the filling while the crust is baking: Zest the lemon before you squeeze the juice, then roll the lemons back and forth against the counter with your hand before juicing. In a large bowl, whisk together the egg yolks, sweetened condensed milk, lemon juice, and lemon zest. 4. Pour over the hot crust, return the pan to the oven, and bake until the filling is set, about 25 minutes. Cool completely in the pan on a wire rack. 5. Refrigerate the cooled pan of uncut bars until the filling is firm, about 2 hours or up to 3 days. Use the parchment paper overhang to lift the bars onto a work surface. Cut into rectangles or squares and dust with powdered sugar just before serving. © FarmgirlFare.com, the sunny side up foodie farm blog where Farmgirl Susan shares recipes, stories, and photos from her crazy country life on 240 remote Missouri acres—and the lemon bars never last very long. Oh yum. I have printed out the recipe and tomorrow it will be put to the test. Thank you of sharing. As I was reading some of your posts I noticed that you are a MO Jennie. I too, was born and raised in the Show-Me, only in a different quadrant. My roots are in the Bootheel where trees and fences are a hindrance. Our regional tree is either a large soybean plant or a tall stalk of corn with at least two ears of corn on each. I do venture west to Table Rock, Tannycomo, or Montauk to drown a few worms or crickets. I met my Hoosier wife in Memphis, TN and the first time I took her north up Interstate 55 to meet my family, her nicest comment in front of my mother was 'This has to be the ugliest place on earth, no trees, no hills, just mile after mile of flat, black dirt.' Mom eventually forgave her and since I was an Army Officer who frequently moved, mom even came to visit us every place we moved, even to Europe once. I'm back home for good and visit the home farm from April until Thanksgiving every year. I would spend the whole year in MO if they had winters like I enjoy in Sarasota Fla.
My boys rib me about being a windshield farmer. Hopefully, they can enjoy my Florida home someday. I love lemon and will have to give these a try. I have a bag of organic lemons just waiting in the refrigerator for these. I love that it has less sugar in it. Do you think this recipe would stand up if I used the left-over egg whites to make a meringue topping? I love lemon meringue pie, but I'm intimidated by the real thing because it so often comes out runny. Oh boy, do those ever look yummy! What a great idea using the sweetened condensed milk. If I only got to eat one cookie/bar before I died, it would be a lemon bar. My grandmother made these for us back in the 70's and I remember hers as much tarter than today's offerings. Can't wait to try this. Oh my, these are wonderful! 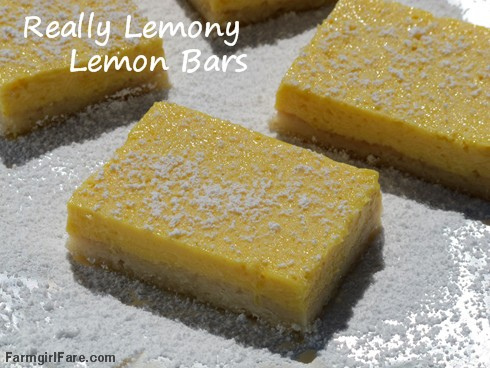 Such a clean, bright, lemon flavor--I really prefer my lemon to taste tart over sweet, and these bars fill the bill. Well, it worked a treat and tasted delicious besides. Didn't have to change the baking time or anything. I didn't tell my family; none of them had any idea the crust was "different". What a fantastic, easy recipe--thank you, Farmgirl Susan! I can't wait to bake these for my mother--she is a big fan of lemon bars and I know she will enjoy them.